This chapter is devoted to a subject that many who come to this work may have thought would be of greatest interest to them. Since at least the 1960s and perhaps before, the modal UK sociology student will have been regarded in the public’s mind, to the extent that there may have been any awareness at all, as, if not wildly radical, then at least having a political disposition towards the left. It may come as some disappointment then that this chapter is rather short and that the conclusions which may be drawn about this stereotype are not definitive. The reason for this is a simple one: the empirically minded researcher should be concerned about representativeness and, if making generalizing statements, should ensure that there is reasonable evidence to support them. However, perhaps surprisingly, there exists a rather small amount of genuinely representative data by which the sociology-students-as-radicals proposition may be properly tested. It is possible to draw some tentative inferences on this question from the occasional surveys of LSE students that have been conducted on several past occasions, but these are necessarily relevant only for the time when they were taken. There is no difficulty in pointing to specific individual sociology students or groups of students over the years who were explicit about their left-wing views and who engaged in politically radical activities, but their existence says little or nothing about how far their political orientations were shared by contemporary peers. Thus, many, though not all, of the conclusions that are drawn about this question are based, less securely, on the characteristics and biographies of perhaps atypical students of maybe atypical earlier eras. Donnelly, S. (2017). Sociology and the Gay Liberation Front – Bob Mellors at LSE. 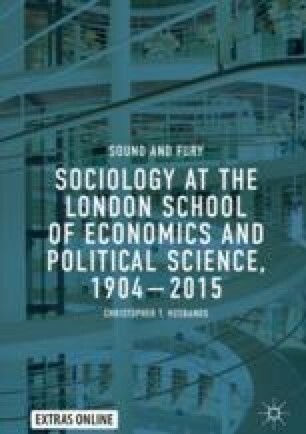 LSE History, blogs.lse.ac.uk/equityDiversityInclusion/2017/02, accessed 6 March 2018.